You need to understand how important Search Engine Optimization is, wherever you sit in an organization. Yet, it is one of those topics where you can get overwhelmed by technical explanations from the experts. SEO is not a technical hack. It is a discipline that needs time and consistent application. To understand how to attract people to a website through search engines you need to understand the words they will enter into the search box. And you’ll need to know the same thing for your competitors. 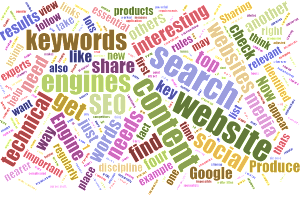 With the help of SEO experts, you can identify the keywords that are most relevant to each of your products or key messages. It may be a series of four or five word phrases or it may be a number of very specific single words. For most companies, the relevant and important content that you want a prospect or client to find is on your main website. To ensure that Google and other search engines can find this content, it is essential to follow their rules in terms of how the website is organized and managed. Google will, for example, give a website a higher score if it is mobile friendly – easy to view on a smartphone or tablet. Another way to get nearer the top is to have pages that load quickly. The website also needs to have a sitemap that search engines will understand. In fact, search engines are just trying to encourage us all to organize websites in a way that makes it easier for humans to find what they are looking for. If a website does not follow their rules it will be relegated to the bottom of the list. Get some help to check all these technical requirements and make the changes. It should take a few hours at most. Now, with your website technically efficient and your keywords identified the basics are in place. The content of the website now needs to be adjusted to appear in searches. By ensuring that the keywords identified are included in everything published on the website (and in the right place), search engines will find the words, documents, videos and photos you want them to find. In addition to updating existing, content it is essential to produce regular new content; again using the same discipline of keywords. Search engines like to see websites which are active and have lots of interesting updates. This is an on-going, day-to-day process that you need to establish. Search engines used to measure how popular your website was through counting the links between your website and other websites. Now the key to appearing at the top of the list in search engines is getting others to share your website content. Sharing is of course what social media is all about. Search engines pay as much attention to keywords and links in social media posts as to website content 1. Having a website with great content and all the right keywords is just the start. If no one tells anyone else about that content, through social shares, it is impossible to get to the top of search engine rankings. A press release, for example, needs to be shared on social media, not just emailed to journalists and published on websites. As the source of the information you must take the first step and get the information out. But it also needs to be interesting and interesting enough for others to share on powerful and influential networks. Produce interesting, well-written content and build your social networks of influence. So that’s an introduction to Search Engine Optimization. I hope you found it clear and understandable. Thanks for taking the time to read it. Please share with others, I’d like to get nearer the top of the search results! 2 I purposefully avoided using words like URL, blog, HTML and metatags in this article. I don’t think the explanation suffers for their absence.